A wise man once told me that projects on a boat are never “done”. So this is an account of some of the projects that we have done or are currently working on. We will try to give as much detail as possible and hopefully anyone working on similar projects can gain a little knowledge through our trails and errors. We really didn’t know for sure how old the rigging was on Agape, or how she had been previously sailed. 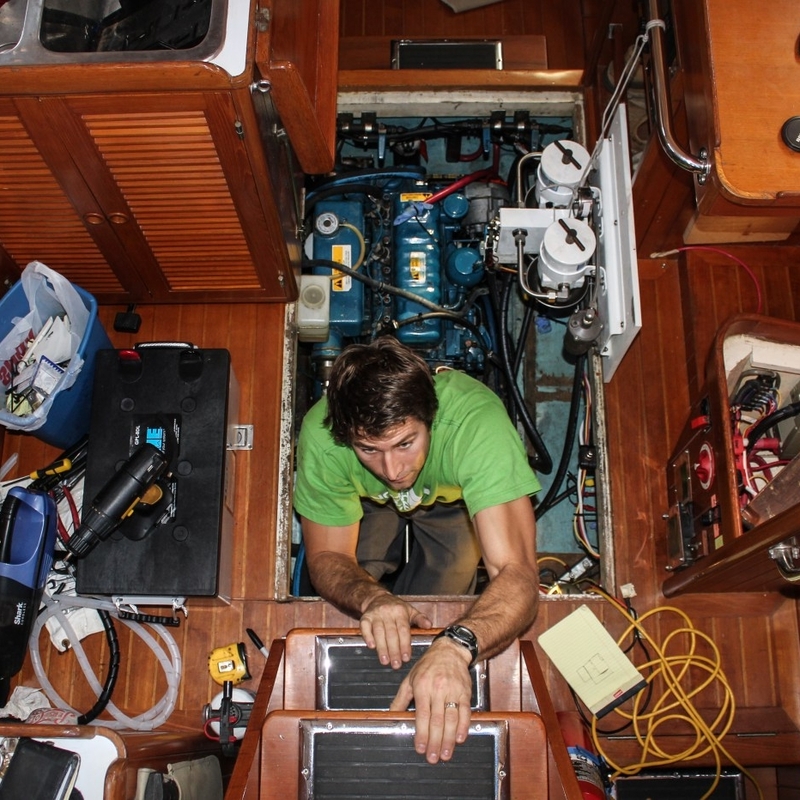 The rigging was oversized as it is on most cruising boats and seemed to be in fairly good condition but we wanted to know for sure before cruising the next few years. When Agape was being built the electrical requirements and amount of electronics was probably very minimal. My guess would be a couple of 12V pumps, VHF radio, lighting, maybe refrigeration, some outlets and a sparse AC system for charging and power at the dock. 83 degrees, sunny, and beautiful….. Perfect for bright work! I have to admit, I thought that doing the rub rails was going to be a lot faster and easier than it turned out to be. Just like every other boat project…. But, it was a beautiful day with no wind and no surf, so why not? It was obvious from the previous owner’s blog and in speaking with him that the batteries where in need of replacing, but for now they worked. We were hoping to put off buying new batteries for as long as we could. New batteries are expensive, and you can’t replace just one. If you replace one, you have to replace them all. So we waited, because we are cheap and wanted to get all we could out of the ones we had. While cleaning the fridge after our island trip I noticed the bottom panel was flexing and could hear water under the sheet metal… uh-oh…well poop!!! So I figured the only thing I could really do was to make an incision in the floor panel and try and diagnose the severity of the issue..
On our way home from La Paz we scheduled a stop at the Baja Naval boatyard for new bottom paint, a new name, and get some work done our rudder. During our original haul out and survey we had found small blisters on the hull and rudder that needed to get repaired while the boat was out of the water.